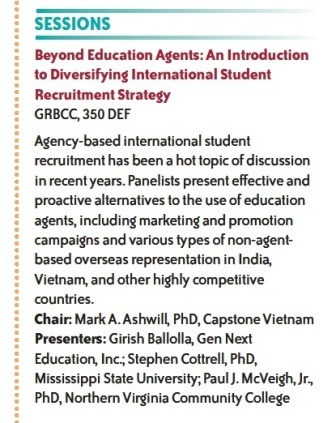 I’m looking forward to moderating and contributing to this general session at the NAFSA 2012 Annual Conference & Expo during the last week of May in Houston, Texas (USA). The session is neither a rejection nor a condemnation of the use of education agents, a sometimes problematic approach to international student recruitment, but rather a recognition that schools that are serious about recruitment need to be proactive and take advantage of opportunities to brand and market themselves, especially in highly competitive markets. They also need to be open to alternative forms of representation. Description: Agency-based international student recruitment has been a hot topic of discussion in recent years. Panelists present effective and proactive alternatives to the use of education agents, including marketing and promotion campaigns and various types of non-agent-based overseas representation in India, Vietnam, and other highly competitive countries. For more information, including the names and affiliations of the other presenters, check out the description on this conference website. I’ve also created a session blog that will be used before and, especially, after the conference. My fellow panelists, who represent a private sector company working in higher education, a community college and a state university, and I are excited about this opportunity to learn from our colleagues and for them to learn from each other. Is affirmative action necessary to diversify a student body? Private schools are becoming more attractive to rich Vietnamese parents than ever. There you don’t see any poor face although they always uphold the idea of diversity, pluralism, multicultures, etc. Instead I think they’re fostering a self-centered way of life.